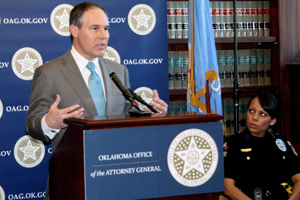 OKLAHOMA CITY – Oklahoma Attorney General Scott Pruitt late Tuesday asked a federal judge in Muskogee to rule in favor of the state in Oklahoma’s legal challenge of the implementation of the Affordable Care Act [Obamacare]. On Tuesday, the Attorney General filed a motion for summary judgment in the federal district court in Muskogee. The motion presents the facts of Oklahoma’s case and asks the judge to rule in favor of the state. The State of Oklahoma is challenging an IRS rule regarding the assessment of tax penalties on “large employers,” including local and state governments. The IRS is attempting to assess “large employer” penalties in states – like Oklahoma – that did not establish state health care exchanges, which contradicts the language of the ACA. The language of the ACA states tax penalties are only to be assessed in states that set up state-based health care exchanges. If the federal judge rules in favor of the state’s motion for summary judgment, the IRS would not be allowed to issue tax penalties on “large employers” for not offering ACA complaint health insurance. Oklahoma’s original lawsuit was filed in January 2011. 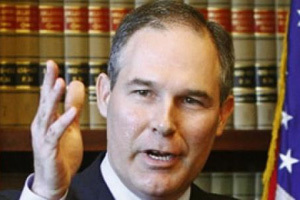 In September, following the U.S. Supreme Court decision, General Pruitt filed an amended complaint to raise issues related to the law’s implementation. This entry was posted in State on February 19, 2014 by admin.